If this is to be true, it looks like T-Mobile has a winning Blackberry on their hands. 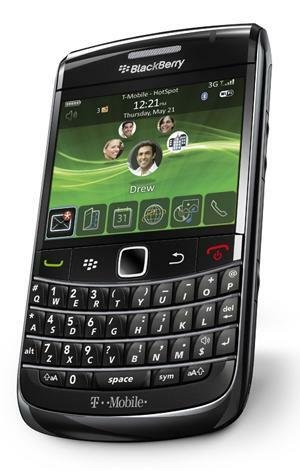 With 3G and UMA calling, this will be a beast of a Blackberry. Any more doubts that this will grace the T-Mobile lineup later this year (possibly November)? Leave your thoughts in the comments! God the leather on the back is lame. I would have to agree, I didn’t like the leather on the back with the Bold. I like it more with this phone, but still. They are just trying to sell it as a premium business phone though, YAY for luxury! Looks hot, sure wish they had this like 2 years ago when I was a Blackberry fanboy. Any rumors or speculation on pricing? I thought they were calling it the Driftwood. This shows it as the Onyx. this phone looks great. I thuoght the chrome finish looked better. but then again the coloring of the silver does fade off after a short period of time. either way I’m glad T-Mobile is expanding and getting on up there with the head honchos. in fact I think it’s become one already. Seems like it is UMA capable. HAHAHAHA…..took them all long enough to get Blackberry to build a phone for their puny 3G network. Hey, wait….aren’t the other carriers rolling out 4G next year? T-Mobile,you’re so far behind the curve it’s pathetic. Hope that merger with Orange works out for you in the UK. There’s a storm a brewin’ here in your US market too I suspect. Cheers for at least finally getting a 3G Blackberry on your network. Now maybe some of us will stay a while longer. Wishful thinking…. I love me some T-mo, but would also like to have a touchscreen. Verizon gets 2 Storms before T-mo gets 1? If At&t gets the Storm 2 before T-mo, I may have to jump ship. Oh, this phone is nice. By the way did anyone see the full article on Crackberry, stating the T-Mobile version will have a different battery and processor than the At&t model? I think it’s humorous when people complain about not having 3G, like that’s what’s separating their phones from supercomputers or something. OMG, my email took five seconds to load instead of two! The horror!!! I those that complain fail to realize that IT’S A PHONE. Currently, it isn’t capable of replacing the desktop computing experience. It’s merely a compliment to it. If having blistering internet speeds while moving about is that important to you, I’d recommend a laptop and an air card. You’d save yourself some aggravation.